• Measures fluorescence intensity at 360/450nm. Compatible assays include ammonia, ammonium, DNA, formaldehyde, protein and peptide. Requires mini glass tubes (see below). Lead time: 8 business days. • A compact handheld reader that measures fluorescence intensity at 360/450nm. 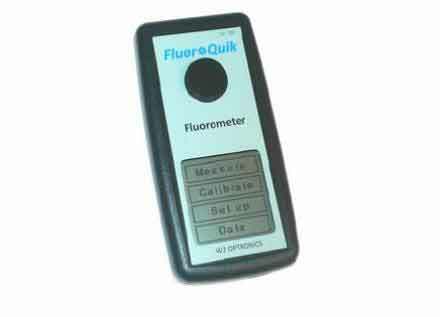 Product Type: Single tube fluorometer. Uses 100-200 µL mini glass tubes or PCR tubes. Very Simple Procedure: 1. Add assay reagent to Blank, Standard and Samples; 2. Calibrate reader with Blank and Standard; 3. Read samples. That is all! Validated applications 1: Ammonia/Ammonium Assay (Cat# DNH3-200); 2: DNA Quantification Assay (Cat# QFDN-250); 3: Formaldehyde Assay (Cat# DFOR-100); 4: Protein/Peptide Assay (Cat# QFPR-200).